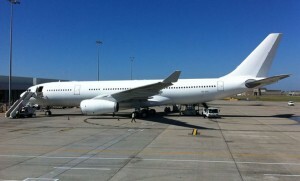 Virgin Blue’s first Airbus A330-200, VH-XFA, has arrived in Australia, flying into Melbourne on March 5. The all-white aircraft features no hints as to Virgin Blue’s much anticipated rebranding and new livery, expected to be revealed in the near future, although conjecture suggests the name ‘Virgin Australia’ could be adopted. Virgin Blue has already released details of its new crew uniforms and the A330’s business class seating configuration. While Virgin Australia is the most immediately obvious choice (assuming they get the ok from Singapore Airlines to use the Virgin name), it kinda disenfranchises the Pacific/Polynesia segments of their market, with Pacific Blue and Polynesian Blue being based in NZ. So I feel Virgin Pacific makes more sense, not to mention the name is complementary to Virgin Atlantic. I wish they’d get rid of the red planes tho, that livery is so incredibly ugly. If they want to go upmarket, they have to look stylish, not cheap and nasty. the industry need something fresh…………….. should be good. Is Virgin doing an Ansett? How many different aircraft types do they want, imagine the logistics issues – crew training, spares, catering etc. Barry – while Ansett made some stupid fleet choices, their mixed fleet was hardly the main cause of their downfall. An airline can operate profitably with a mixed fleet provided the aircraft are utilised on routes suited to that type. How many different types do Qantas (mainline) have? A330-200, A330-300, B747-400, B767-300 (both the 338 and the 336 variant), B737-400, B737-800. A320, A321 (Jetstar), Dash-8 (mixed Variants – QantasLink), and B717 (Cobham). Virgin’s mix (777, 737, Ejet and A330) seem fairly simple to me. I agree with TIMMY they need to get rid of the red planes they are so ugly n cheap looking, especially if they are trying to increase there market share. Im loving the new uniforms looks very professional , and yeah I wondered also why they have such a mix fleet also, and there was talk they are getting rid of the Embraer Jets. With the rebranding I do like the name Virgin Pacific as it embraces its other airlines and the region, I would find it very unlikely Singapore will allow the use Virgin Australia, but you never know. I hope they use the FONT they created for Virgin Atlantic rebranding, very nice ,stylised. It just seems as if Virgin is trying to become Qantas Lite – the point of difference for the past decade was Virgin’s struggle to beat the ‘big guy’ – but now that ‘big guy’ is heading up Virgin and trying to recreate his former Qantas Glory? DJ are retaining the e-jet 190’s. The e-170’s are being replaced by ATR’s for intra WA flights only (wetleased by skywest). Sorry to see the 170’s go. Nice to have a real jet on regional routes. If VB withdraws its jet services from the Canberra Sydney/Canberra Melbourne route and replaces them with ATRs they can say goodbye to another passenger. Well I am a flight attendant, and it is always nice, and refreshing to read what the general public think\feel. Keep up the good work. Everyone’s opinion is important, and prevents complacancy! I have some inside news….from a friend who works at virgin and they had a meeting just yesterday…. The new name for domestic is Virgin Australia all planes will be painted in similar colours to the new uniforms i.e. dark red, purple and a silvery/bronze colour. V Australia will be used for international services and will remain as is. Next time you are on a DJ flight check the name tag of the hostie and I bet the font (the same as the Virgin Atlantic font) makes an appearance on the jets etc….or they will use the same font as virgin america….